This model of the Baysport 640 is called Sports; it might better be called Convertible. A combination of an extension to the Bimini, curtains and clears turns it from a competent fishing boat into a camper. This ability is as likely to be used ashore as on the water. Where normally a long weekend of fishing in the south west requires tents and the like or the expense of a hotel, sleeping bags in the Baysport’s cockpit will do the trick. The cockpit is a family friendly place. 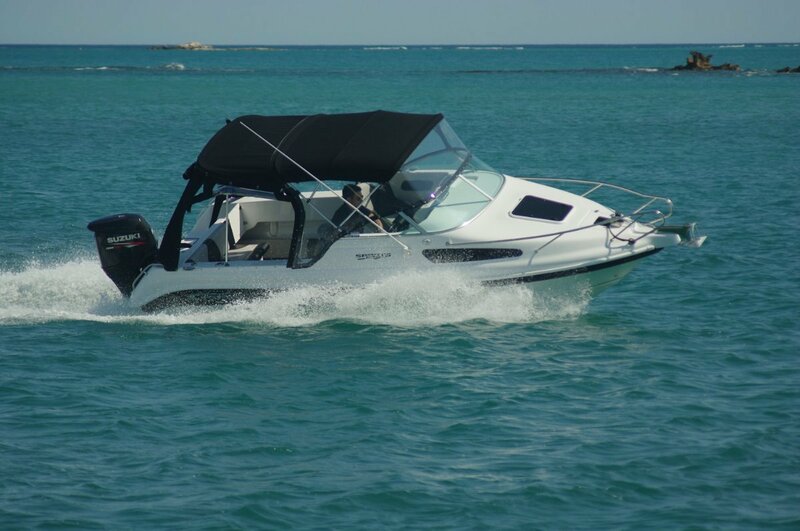 High coamings give security to any little ones on the carpeted deck, and five larger people are given good comfort levels on two bucket seats and the rear settee. Steerage quality sitting is provided for a sixth on the lid of an aft extension of the navigator’s seat base. The cockpit multiplies in size with the rear lounge folded and the vast storage bin that sits beneath it removed. It is all useable fishing space or the floor of a bedroom for a couple on air mattresses. Features enhancing the quality of camping on board include an ice box, a sink-wash basin and the ability to use the sink’s water pump for a fresh water shower. This gear is tucked under the navigator: the ice box below the auxiliary seat, the sink revealed when the main seat itself is tilted forwards. The camping concept requires a boat to absorb a lot of gear; the 640 can certainly do that. The rear bin alone is capable of housing air mattresses, sleeping bags and spare clothing with room left over. More storage is available under the bunks, in two-level caves under the driver’s seat, and in capacious side pockets. The cuddy is large enough for the bunks in it to be adult length; infills turn the compartment into one big bed. A toilet lives under one of the infills and, to make it useable by the modest, a fabric bulkhead rolls down to screen the space from the cockpit. A clear fore hatch and side windows let in plenty of light. Fishing gets its full share of attention with under deck catch tank, bait bin and coaming rod sockets. Less specific but welcome attributes are space, stability, pop up cleats and that high coaming. The up market Garmin sounder-plotter, too, would make the average fisho’s mouth water; it shares electricity with an equally top line stereo system. The 640 is rated for up to 175hp outboards. It could certainly handle that power, but the 140 Suzuki fitted was good for 38 knots which would be as much of a power margin most owners could ask for. The hull is shapely enough to maintain a high cruising speed in imperfect conditions. And, naturally, 38 knots in good conditions – although high 20s would deliver better economy and give the motor an unstressed life. A power windlass might seem an extravagance in a 6.4 metre boat, but once experienced it quickly feels like a necessity. The unit is the type than winds rope and chain onto a drum: foolproof until they invent a better fool. It is typical of the thought the builders put into this attractive boat. Placement of seat bases, controls and gauges is close to perfect; grab rails and oddment containers are in exactly the right places; all the details have been considered.